Consumer Watchdog’s theme this year is health. Not just health in the obvious sense, our physical health, but also our financial, legal, health, cyber and even mental health. We’re looking at every aspect of health and the reason is simple. Everyone, and I do mean everyone, benefits from people being healthier. We benefit as individuals because none of us wants to be unwell or dead and we don’t want our friends and relatives to be unwell or dead either. But even the companies from which we buy things benefit as well. It benefits them just as much if their customers are healthy. In fact, it’s hard to think of an industry that doesn’t benefit from healthy customers except private hospitals and funeral parlours. Unfortunately, there’s one other group that benefits from our ill-health and more specifically our ignorance and fear about health matters. The fake health industry. We’ve encountered a number of them over the years. It started with those advertisements that used to be seen in our newspapers advertising a wide range of miracles including the enlargement or shrinkage of various body parts, liberation from curses, victory in court cases, protection from evil and successful businesses. Those ads don’t appear in the papers any longer, they’ve evolved into the advertisers you can still find on Facebook, often advertising pregnancy termination services across the border from South Africa. We’ve also had a number of encounters with people advertising Herbalife products who’ve made astonishing claims about the products. They’ve suggested that Herbalife products can help improve your blood pressure, treat diabetes, improve arthritis and even cure cancer. I had a long conversation by SMS with one distributor who told me that Herbalife “provide scientifically produced nutrition that have helped many” and that the prostate cancer I claimed a friend was suffering was “a lifestyle and nutrition sickness” caused by “our food regimen of today”. This is all complete nonsense of course. Obviously our diet is connected with our health but the diet most people have in 2017 is healthier than it’s been ever before. We’re living longer, healthier and even happier lives that any of our ancestors did. Quite the opposite of what a lot of Herbalife proponents would have you believe. I should stress that these claims aren’t endorsed by Herbalife and when I contacted Herbalife in South Africa and described what their distributors had said, they gave the strongest impression that they were appalled and promised to put an end to it immediately. Sadly, for every distributor that gets ejected from the Herbalife family, another appears. One of them advertised on Facebook that “if u want to loss weight, gain weight, conctipation, big belly, building body 4 sports, los of energy, need to relax ur nerves special 4 students, problem with blood circulation, back pain and joint, period pains and skin problem let herbalife help u”. Clearly his typing skills could do with a health boost but I think that’s probably another area where Herbalife can’t actually help. However, he was ambitious. He wasn’t just trying to say that Herbalife products could treat all these problems, he went further. He later posted that their products were actually “approved through BOBS” which was a particularly shameless lie. The Bureau of Standards do not “approve” such products or endorse claims as ridiculous as these. These claims are deliberately trying to deceive the consumers of Botswana. The purveyors of this juice are telling lies. There is no product that can do all these things. If there was such a product, someone somewhere would have won the Nobel Prize for Medicine by now and probably the prize for Peace as well. Of course, I’m not suggesting that fruit juices aren’t good for you but you’d be much better off if instead of spending P350 on a bottle of juice sold by people making preposterous claims about its health-giving properties you bought yourself some fresh fruit and vegetables. You’d also be a lot healthier if you didn’t join another pyramid-structured business that’s guaranteed not to make you wealthy but like all other such schemes, will actually make you poorer. People often ask me why I’m so opposed to so-called health products such as silly fruit juices and pseudoscientific approaches such as homeopathy, reflexology and acupuncture. Yes, they say, the scientific evidence shows that these things offer precisely nothing beneficial but they don’t do any harm. So what’s the problem? The problem is simple. Firstly, I believe in truth. People shouldn’t tell lies about health products and promise people false hope, particularly people who are unwell. That’s illegal as well as immoral. Secondly, and much more importantly, people who are unwell and worried about their future are often desperate. They’ll do anything to find a cure or a treatment for what’s ailing them and that often means they’ll suspend their skepticism (if they had any to begin with) and swallow any treatment the first quack they meet offers them. Even worse than that, they often stop taking their real medication and stop making appointments with real doctors, the people that can really help them. So that’s why I oppose companies that claim their fruit juice or their vitamins can help with all sorts of disorders and illnesses. 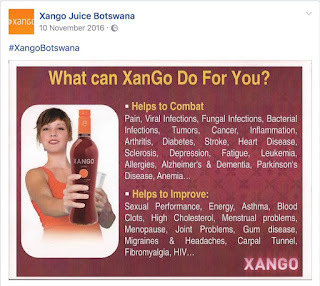 It’s because they’re threatening our health rather than promoting it and the sooner they learn that in Botswana we don’t tolerate that sort of thing the better.